More than 500 historical papers taken from printed books made between the 15th and the 18th century were available from an earlier study (Barrett 1989). Some of these sheets, particularly those from before 1500, may have originally been intended for use as writing papers. However, clear differences between printing and writing papers were not evident to us. From the 500-sheet pool we selected two sets of specimens: one of papers that seemed weaker and one of papers that seemed stronger. All the papers in each set were then arranged in a gradation from lightest to darkest in color. From each of these sets we selected 20 specimens that represented the full range of light to dark colors. The first 20 (weaker feel) we labeled group W, and the second 20 (stronger feel), group T (fig. 1). 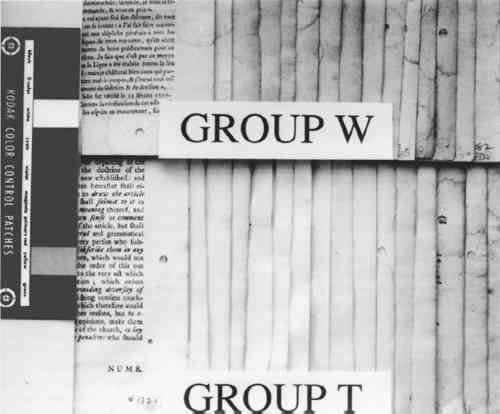 During the selection process we considered no other variables (such as paper thickness), nor did we incorporate other means to make the selection more objective (use of additional individuals during selection or use of blindfolds during the initial division of specimens into stronger and weaker paper sets). Nevertheless, we felt the 40-specimen final set met our goal of representing a range of apparent paper strength and condition. Following the selection process, the “W” and “T” designations were not considered variables in the study because instrument analyses were not used to gather data on actual paper strength. Fig. 1. Forty selected historical specimens prior to analysis. We used the darkness or lightness of the paper as our dependent variable and primary indicator of relative condition because of the common inclination to associate lighter-colored papers with those in better condition. While there are exceptions to this association (or that made between darker papers and poorer condition), for this project we assumed a dark-to-light scale to be a useful qualitative indicator of paper condition and probable strength. In his study of rag and wood pulp papers aged for 72 hours at 100°C, Rasch (1929, 501) commented that “in general, it is evident that papers which are impermanent in chemical or physical properties will also tend to discolor readily.” Destructive strength testing was not an option during this study due to the minimal area of paper specimens available. All the 40 specimens were analyzed for Minolta Chroma Meter L∗ values by Irene Brückle at the Buffalo State College Art Conservation Department. The L∗ value gives an indication of where the value of the paper's color falls on a black-to-white scale. We interpreted L∗ data as relative “dark” (lower numbers) to “light” (higher numbers) values. Three sheets of Whatman no. 4 filter paper served as the background for all measurements. The instrument used was a Minolta Chroma. Meter CR-221 with a 45-degree illumination angle, 0-degree viewing angle, 3mm measuring area, calibrated against standard white (barium sulfate plate). Five measurements were made on each side of each specimen, taking care to choose the most even paper areas and avoiding print, dark inclusions, stains, or discolored paper edges. Determinations were made midway up the leaf whenever possible. More ideal L∗ values might have been obtained from multiple layers of paper cut from each specimen, prior to the hydroxyproline determinations. Using each specimen as its own background (instead of the Whatman no. 4 filter paper) would have helped overcome any transparency problems. This approach is recommended in similar future work. For the present, we consider the procedure used and the resulting L∗ values to be useful indicators of the relative “darkness” or “lightness” of the specimens tested. Calcium ppm values were from a single proton-induced x-ray emission (PIXE) determination per specimen, and surface pH values are the mean of 2 analyses per specimen. Both calcium and pH data were available from an earlier study (Barrett 1989). While there could have been some change in surface pH or L∗ values between 1989 and 1994, because of the relatively brief intervening period of natural aging of already old specimens, we have assumed any changes to be of minor significance. After selection of the 40 specimens and completion of L∗ and gelatin analyses it became apparent that 5 specimens lacked data either for pH or calcium, leaving complete data sets on 35 specimens. A microscale modification of the quantitative procedure given in TAPPI T-504 om-89, “Glue in paper (qualitative and quantitative determination)” (TAPPI 1991a), was used for the gelatin analysis. To each reaction tube containing the hydrolysate residue was added deionized water (0.5 ml, not added to calibration standard tubes), CuSO4 (0.3 ml, 0. 0.02 M), NaOH (0.3 ml, 2.5 M), and H2O2(0.3 ml, 4%, freshly prepared before use). Care was taken not to splash reagents high up on the walls of the tubes. Tube contents were mixed after each addition with a vortex mixer. Tubes were capped and kept at room temperature for 30 minutes. They were then placed in a 70°C water bath for 5 minutes to destroy excess H2O2, after which they were cooled to room temperature. Following the destruction of H2O2, each reaction tube was treated identically, i.e., the same amount of time elapsed between the addition of the color-forming reagents and the measurement of the absorbance of the solution in the spectrophotometer. To the cooled tube was added, with mixing after each addition, H2SO4 (0.8 ml, 1.5 M), and p-dimethylaminobenzaldehyde (Aldrich 15647-7, unrecrystallized) in 1-propanol (0.8 ml, 5%, freshly prepared before use). The tube was then capped and placed in a 70°C water bath for 50 minutes followed by cooling in a 20 ± 2°C bath for 3 minutes. Within the next 2 minutes the tube contents were made up to the same volume as the calibration standards, the tube shaken; and the absorbance of the solution read in a Hewlett Packard Model 8452A diode array spectrophotometer at 560 nm using a reagent blank between every 10 readings (about once every 50 minutes). Sized reference standards were prepared from Whatman Chr4 chromatography paper, Barrett handmade text-weight flax paper, and Mosier handmade text-weight 98% cotton/2% flax paper. For each paper type, efforts were made to prepare standards that were lightly (under 1% gelatin), moderately (around 3% gelatin), and heavily (over 5% gelatin) sized. Each reference standard was prepared individually by applying, to an approximately 5mm2 piece of paper, a wt/wt aqueous photograde oven-dried gelatin (Rousselot) solution under conditions designed to minimize evaporation of the water. From the weight of the solution applied, the weight of the gelatin on the paper was calculated. All of the papers tested negative for starch with iodine solution (Barrett 1989). No other tests (such as for thickness, fiber type, bluing, or bleaching) were undertaken. Pearson correlations and their corresponding p-values were calculated using statistical analysis tools in Microsoft Excel.